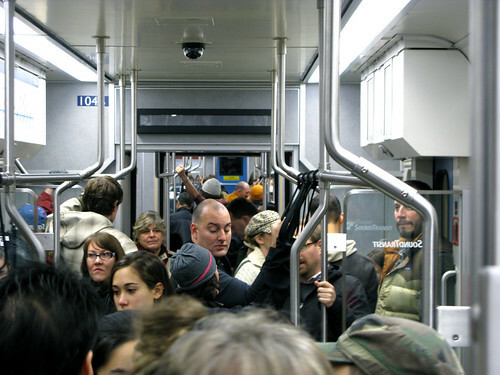 Soaring gas prices lured Americans out of their cars and onto public transportation, adding up to a five percent increase in ridership in the first three months of 2012, the most significant 1st quarter increase since 1999. According to the American Public Transportation Association (APTA), Americans took almost 125 million more rides on public transit in the first three months of 2012 than they did in the same timeframe last year. Ridership declined following the September 11, 2001, terrorist acts and had remained more or less stagnant until last year. The federal Energy Information Administration said that U.S. gas demand fell to a 11-year low in the 1st quarter, at less than 8.5 million barrels a day; that was 1.5 percent less than the 2011 1st quarter average. The drop came as the average nationwide price of regular-grade gasoline set a 1st quarter record of $3.60 a gallon, an increase of 9.6 percent when compared with last year. APTA reported that all public transit modes saw 1st quarter increases, with light-rail use up by 6.7 percent and subways and elevated train ridership up by 5.5 percent. Commuter rail ridership rose 3.9 percent, while bus ridership was up approximately 4.5 percent. The fact that people are finding new jobs helped, said Melaniphy. Ridership on heavy rail — subways and elevated trains — rose in 14 of 15 systems. Use of light rail — streetcars and trolleys rose in 25 of 27. And 34 of 37 large cities saw increases in bus ridership. “It’s nationwide,” Melaniphy said, resulting in fuller trains and buses straining system capacity. Fully 12 cities saw their highest ridership ever, including New York; Boston; Oakland; San Diego; Charlotte; Tampa; Indianapolis; Ann Arbor, MI; Fort Myers, FL; Ithaca, NY; and Olympia, WA. The 17-nation Eurozone is at risk of falling into a “severe recession,” the Organization for Economic Cooperation and Development (OECD) warned, as it called on governments and the European Central Bank to act quickly to keep the slowdown from becoming a drag on the global economy. OECD Chief Economist Pier Carlo Padoan warned the euro-zone economy has the potential to shrink as much as two percent in 2012, a figure that the think tank had described as its worst-case scenario last November. The OECD -which comprises the world’s most developed economies — said its average forecast was that the Euro-zone economy will shrink 0.1 percent in 2012 and grow a mere 0.9 percent next year. “Today we see the situation in the Euro area close to the possible downside scenario” in the OECD’s November report, “which if materializing could lead to a severe recession in the Euro area and with spillovers in the rest of the world,” Padoan said. The report believes that Europe will lag behind other countries, especially the United States, where the economy is expected to grow 2.4 percent this year and 2.6 percent in 2013. “There is now a diverging trend between the euro area and the U.S., where the U.S. is picking up more strongly while the euro area is lagging behind,” Padoan said. Europe is split between a wealthier north that is growing and the southern nations that are falling into recession, according to OECD statistics. Germany, Europe’s largest economy, will grow two percent next year after expanding 1.2 percent in 2012. France, the Eurozone’s second-biggest economy, will grow 1.2 percent next year after expanding 0.6 percent this year, the OECD said. By contrast, Italy’s economy is expected to shrink 1.7 percent this year and 0.4 percent in 2013. Spain will remain mired in recession, with contraction of 1.6 percent this year and 0.8 percent in 2013. Padoan has asked Eurozone leaders to enter into a “growth compact” to promote expansion while cutting deficits. French President Francois Hollande has made achieving this type of pact the focus of his European diplomacy. To protect its economic recovery, the OECD urged the American government to move very gradually to tighten its budget. A wave of U.S. spending cuts and tax hikes – known as the “fiscal cliff” — are set to take effect in January unless politicians agree to delay at least some of them. Bush-era tax cuts and benefits for the long-term jobless are both expected to expire. Another $1.2 trillion in spending cuts on federal programs would take effect as a result of Congress’ failure last year to find a comprehensive deal to cut the budget deficit. The OECD said these actions would be the wrong fiscal policy given the still-fragile condition of world’s largest economy. “The programmed expiration of tax cuts and emergency unemployment benefits, together with automatic federal spending cuts, would result in a sharp fiscal retrenchment in 2013 that might derail the recovery,” according to the OECD. Wall Street economists say that fiscal policy could tighten by about $600 billion in 2013, or about four percent of GDP, if lawmakers cannot agree on what programs to cut. 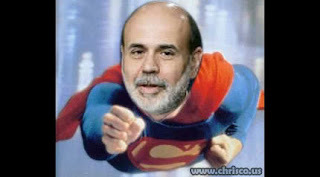 Goldman Sachs estimates the “fiscal cliff” could trim approximately four percent from GDP in the first half of 2013. The majority of economists, however, expect lawmakers to act before that particular hammer has an opportunity to fall. In a body known for such talented orators as Senator Everett McKinley Dirksen and Senator Robert Byrd, it’s disheartening to learn that a new study has determined that the average member of Congress speaks at the same level as a high school sophomore – that’s nearly a full grade lower than in 2005. According to the independent watchdog group, Sunlight Foundation, some people will view its findings as “a dumbing down of Congress” while others will interpret the report as “more effective communications” from lawmakers. To contrast, the typical American reads between an eighth-grade and ninth-grade level. Representative Mick Mulvaney, a freshman from South Carolina, scored the lowest, speaking at a 7.94 level, a level between the seventh and eighth grades. Mulvaney, who received his bachelor’s degree at Georgetown University and law degree at the University of North Carolina – Chapel Hill, said he follows a simple rule: Avoid using big words when a little one will do. “Gosh, I guess I should be disappointed that I’m not using my higher education to better use, but, oh well,” Mulvaney said. “I hope people don’t take it as a substitute for lack of intellect, but small words can be just as powerful as big words sometimes.” California’s Representative Dan Lungren was ranked the highest by the Sunlight Foundation, speaking at a 16.0 level on the Flesch-Kincaid scale. The Washington Post’s Ezra Klein wonders if political polarization is dumbing down Congress. According to Klein, “Polarization has changed the way that members of Congress vote. But it turns out it may also be changing the way they talk. Generally speaking, the most moderate members on both sides of the aisle speak at the highest grade levels, whereas the most politically extreme members speak at the lowest grade levels. Before 2005, Republicans had spoken at a higher grade level than Democrats; now it’s flipped. Newer members are also likely to speak more simply than more senior ones, so freshmen Republicans are most likely to speak at the lowest grade level in Congress. Sunlight plugged speeches by members of Congress into a searchable database and then applied the Flesch-Kincaid test to determine the lawmaker’s score. Longer words and longer sentences equal a higher grade level, according to Flesch-Kincaid. Sunlight found that members of Congress, on average, spoke at a 10.6 grade level, a change from 11.5 score in 2005. The Sunlight Foundation noted that two speeches viewed among the best in American history — the Gettysburg address by President Abraham Lincoln’s Gettysburg address, or the “I Have a Dream” speech by Martin Luther King Jr. only scored at 11.1 and 9.4 grade levels. Another point is that before 2005, Republicans spoke at a slightly higher grade level than Democrats. Since that time, Democrats have spoken at a slightly higher grade level than Republicans. According to the Sunlight Foundation’s analysis of some of the country’s most prominent documents, the U.S. Constitution is written at a 17.8 grade level; the Federal Papers at a 17.1 level; and the Declaration of Independence at a 15.1 level. An analysis determined that President Barack Obama’s 2012 State of the Union (SOTU) address had an eighth-grade comprehension level – the third lowest score of any SOTU address since 1934). Debt collectors and credit reporting agencies — businesses that impact thousands of consumers — would face federal supervision for the first time under a rule a new federal watchdog proposal, which would allow the Consumer Financial Protection Bureau (CFPB) to examine approximately 200 firms, including large debt collectors. According to the proposal, these two segments of the consumer finance industry will be a high priority for the CFPB as it scrutinizes the inner-workings of banks, as well as thousands of firms that offer a wide-range of financial services. The bureau is planning to police payday lenders as well as non-bank firms that offer home and student loans. Congress created the agency through the 2010 Dodd-Frank financial bill to control misleading financial practices and examine segments of the financial marketplace that had previously escaped federal scrutiny. “This oversight would help restore confidence that the federal government is standing beside the American consumer,” said CFPB Director Richard Cordray. The number of Americans with debt under collection has grown to about 30 million Americans over the past 10 years, according to the New York Federal Reserve. The average amount under collection has also steadily grown over the years to $1,400. According to the CFPB, the market is dominated by firms that collect debt owned by another company in return for a fee; firms that purchase debt and collect the proceeds for themselves; and debt collection attorneys and law firms that litigate to collect. “Our proposed rule would mean that those debt collectors and credit reporting agencies that qualify as larger participants are subject to the same supervision process that we apply to the banks,” Cordray said. Considering that there are so many consumers struggling with unemployment and debt, Cordray said that more Americans are indebted to debt collectors and credit reporting companies, which employers frequently consult prior to hiring. 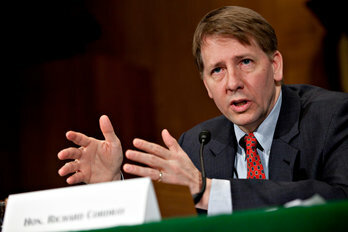 Cordray said that employers’ use of credit reports in hiring decisions “may not always be fair for consumers, but it reflects the reach and scope and importance of the consumer reporting field.” That explains why the bureau wants to target those who gather and analyze consumer financial data, as well as those who are tasked with collecting on unpaid bills. The consumer bureau will soon announce what other kinds of non-banking financial firms it plans to scrutinize in coming months, Cordray said. The process of examining records and collecting data from these firms can lead to enforcement if regulators find violations of the law. In these cases, the consumer bureau could find breaches of the Fair Debt Collection Practices Act or the Fair Credit Reporting Act. Under the proposal, debt collectors with more than $10 million in yearly receipts from collection will undergo supervision by the consumer bureau. This threshold would cover nearly 175 debt collection companies — four percent of all such companies — that collectively account for 63 percent of the industry’s annual revenue. Cordray said the goal is to hold these companies to the same oversight as banks. “This oversight would help restore confidence that the federal government is standing beside the American consumer.” Cordray continued, “The supervision tool is a very powerful tool. It’s a very powerful way for us to secure compliance with the law. It’s an authority I wish I had had in previous positions.” He stressed that smaller companies in the two industries are still required to follow consumer protection laws and could be subject to CFPB regulation. But under the proposed rule, the CFPB would gain “complete access” to the books and information of large companies to ensure they are following those requirements, and will devote individual attention to each. According to Dodd-Frank, the rule must be finalized by July 21, one year after the agency opened its doors. Are Gas-Sipping Cars Leaving Hybrids in the Dust? When Cadillac is staking its comeback on a compact car that boasts fuel economy approaching 40 mpg, what does it mean for hybrid and electric vehicles? Cadillac’s ATS sedan is one example of how carmakers at the Detroit Auto Show are re-emphasizing small, powerful models with more fuel-efficient engines such as sport-utility vehicles; even, please note that we are talking gas here, hybrids are taking a back seat. Additionally, General Motors’ luxury brand says that the ATS will have a turbo-charged four-cylinder 270-horsepower engine that offers impressive fuel economy. Meanwhile, Ford is dropping plans for a hybrid version of its popular Escape SUV. Although recent auto shows have been stocked with gas-electric hybrids and SUVs, slow hybrid sales have brought a dose of reality. Carmakers realize they can give buyers what they want and avoid the expense of electric motors and batteries by making cars smaller and getting significantly improved fuel economy from traditional gas engines. “The advantages of hybrids are getting harder to justify,” said Scott Corwin, a vice president with consulting firm Booz & Co. “It’s the cost differential. Consumers are rational and they understand the cost of ownership.” Hybrid sales slowed in 2011 to just 2.2 percent of auto sales, down from 2.4 percent in 2010, according to researcher LMC Automotive. The Chevrolet Volt plug-in hybrid lures people into the showroom, said Chris Perry, Chevrolet’s vice president of U.S. marketing. With fewer than 8,000 sales last year, consumers often went to a Chevy dealer to look at the Volt and settled on something else less pricey. The administration is advocating aggressive fuel efficiency mandates for the U.S. fleet to decrease oil dependence, particularly through more electrical vehicles. President Barack Obama would like to see one million electric vehicles on the roads three years from now, a goal that industry insiders say is too optimistic. The industry is simultaneously investing in battery technology while making more affordable gains through improvements in conventional engine and transmission systems. Administration officials are fighting Congressional and consumer skepticism about the wisdom of the $7,500 tax credit that mainly has benefited more well-heeled buyers, who experts say would have been able to purchase the technology without it. Jeremy Anwyl, CEO of online consumer research group Edmunds.com, said plug-ins are most popular on the West and East coasts with “early adopters,” or educated consumers passionate about using less gasoline. “For these folks, affordability is not the issue,” Anwyl said. Automakers have little choice but to promote more hybrids as they prepare for fuel-efficiency requirements that will require significant increases by 2020. However, advances such as Ford’s EcoBoost technology have raised mileage for gas-powered engines —the new Fusion midsize sedan can get 37 miles to the gallon — though bigger gains are still needed. That’s why many are bullish on alternative engines. “Internal combustion can’t get all the way there, so you need an alternative,” said Russell Hensley, a partner with the consulting firm McKinsey & Company. “The only alternative we have at the moment is electrification.” McKinsey listed “uncertainty around future adoption of hybrid/electric powertrain technology” as one of several challenges facing automakers in coming years. According to McKinsey, hybrids could account for up 25 percent of sales by 2020, with battery-powered cars making up five percent. It confirmed that internal-combustion engines would dominate the industry through at least 2030. Over at the Rocky Mountain Institute, Randy Essex and Ben Holland point out that when gas-electric hybrids first rolled out in 2000, the Honda Insight and Toyota Prius had sales of just 9,350. Those figures looked anemic at the time, too. But in the ensuing years, the technology caught on and more than two million hybrids have been sold in the United States. If that’s any prologue, it could bode well for future plug-ins. A rare glimpse of bi-partisanship was seen today in the House of Representatives as Representative Gabrielle Giffords (D-AZ) officially resigned, slightly one year after being shot in the head at a “Congress on Your Corner” session in her native Tucson. Giffords, who resigned to devote her time to undergoing intensive rehabilitation, walked with a limp. With the guidance of her friend, Democratic Debbie Wasserman Schultz (D-FL), Giffords slowly made her way to the well at the front of the House chamber. Another friend, Representative Jeff Flake (R-AZ), held her hand. Wasserman Schultz praised her colleague’s strength. “I am so proud of my friend,” she said. “It will always be one of the great treasures of my life to have met Gabby Giffords and to have served with her in this body,” the Florida congresswoman said. According to Giffords’ resignation letter, “Even as I have worked to regain my speech, thank you for your faith in my ability to be your voice. Everyday, I am working hard. I will recover and will return, and we will work together again, for Arizona and for all Americans,” she pledged to her former colleagues and constituents. Giffords, who has promised that she will return to public service when she is fully recovered from her gunshot wound, faces months – even years – of rehabilitation. One of Giffords’ final actions in her five years in Congress was to vote in favor of a bill that she had co-sponsored and which dealt with smuggling on the United States Mexico border. The measure passed unanimously. The legislation outlaws the use of ultralight aircraft to smuggle drugs. Giffords’s congressional district includes part of Arizona’s southern border with Mexico. The legislation, which the Senate is expected to approve quickly, would subject violators to up to 20 years’ imprisonment and a $250,000 fine. The session was emotional at times. Democratic Minority Whip Representative Steny Hoyer (D-MD) said “The House of Representatives of America has been made proud by this extraordinary daughter of this House, who served so well during her tenure here, who felt so deeply about her constituents and cared so much for her country. Gabby, we love you. We have missed you.” Speaker of the House John Boehner (R-OH) was teary-eyed as he formally declared Giffords’ resignation. With Giffords’ resignation, Arizona Governor Jan Brewer is required to schedule a special election to fill the term. The primary is likely to be in April and the general election in June. The winner will then be up for re-election to a full two-year term in November. Arizona law requires that the governor act within 72 hours to schedule a special election to fill a vacant U.S. House. According to Brewer spokesman Matthew Benson, the 72 hours begins Wednesday, January 25, at 5 p.m. because that is when Giffords’ resignation takes effect. First-class mail is likely the next casualty as the United States Postal Service (USPS) looks for ways to stave off bankruptcy. The USPS is planning to shutter 252 mail processing centers nationally and slow first-class delivery as soon as spring, citing steadily declining mail volume. According to USPS vice president David Williams, the agency wants to effectively eliminate the likelihood that stamped letters will arrive at their destination the next day. Williams says the postal service is not “writing off first class mail”; rather, it must respond to changing market realities in which people are turning more to the Internet for email communications and bill payment. After peaking in 2006, first-class mail volume is now at 78 million. It is projected to drop by approximately 50 percent by 2020. The estimated $3 billion in reductions are part of a wide-ranging effort by the cash-strapped USPS to cut costs without receiving any help from Congress. Although the changes would provide short-term relief, they ultimately could prove counterproductive by moving more business onto the Internet. The move has the potential to slow everything from check payments to Netflix’s DVDs-by-mail, add costs to mail-order prescription drugs, and threaten the existence of newspapers and time-sensitive magazines. Ideally, first-class mail would be delivered in two to three days, a change from the current one to three days in the 48 contiguous United States. But, the postal service said mailers “who properly prepare and enter mail at the processing facility prior to the day’s critical entry time” could have their mail delivered the following delivery day.” Magazine delivery could take two to nine days. If the plan is approved by the Postal Regulatory Commission, the changes have the potential to save about $3 billion, and allow the Postal Service to cut approximately 28,000 jobs. Sally Davidow, a spokeswoman for the American Postal Workers Union, said the changes will hurt communities and take the Postal Service in the wrong direction. “They should be trying to speed up and modernize the mail, not slow it down and make it less relevant in the digital age,” she said. Davidow said the retirement payment mandate and overpayment into the Postal Service’s pension accounts are the main culprits. She believes that USPS leadership should focus on pressuring Congress to fix them instead of cutting service and jobs. “Addressing those two things would go a very long way toward resolving the crisis and giving the Postal Service the breathing room and the capital it needs to modernize and to be relevant in the digital age,” Davidow said. According to Bloomberg’s editors, “Even as they were tapping the Fed for emergency loans at rates as low as 0.01 percent, the banks that were the biggest beneficiaries of the program were assuring investors that their firms were healthy. Moreover, these banks used money they had received in the bailout to lobby Congress against reforms aimed at preventing the next collapse. By keeping the details of its activities under wraps, the Fed deprived lawmakers of the essential information they needed to draft those rules. The Dodd-Frank Wall Street Reform and Consumer Protection Act, for example, was debated and passed by Congress in 2010 without a full understanding of how deeply the banks had depended on the Fed for survival. Similarly, lawmakers approved the Treasury Department’s $700 billion Troubled Asset Relief Program to rescue the banks without knowing the details of the far larger bailout being run by the Fed. Derek Thompson, a senior editor at The Atlantic, argues that the Fed’s secret bailout is a sign that it was doing its job. According to Thompson, “First, you can be furious that the Federal Reserve ‘committed’ $7.7 trillion — a sum of money equal to half of the U.S. economy — to save the financial system. I understand the shock, but we were at the precipice of catastrophe and that money wasn’t ‘spent’ so much as it was put at risk and subsequently recouped. The economy has struggled in the three years since, but we avoided meltdown. The trillions worked. American companies ordered more heavy machinery, computers and other long-lasting manufactured goods in September, an encouraging sign for the shaky economy. The increase in demand for these durable goods suggests businesses are staying with investment plans, despite slow growth and a lack of consumer confidence. Durable goods are products expected to last a minimum of three years. Core capital goods are products that have nothing to do with defense or aircraft. The gains are driven by tax breaks given to businesses for investments made this year, an incentive Congress approved last December to boost the lethargic economy. Robust demand for core capital goods is a strategic reason why economists expect an annual growth rate of 2.4 percent in the 3rd quarter. That would be a major improvement from the first six months of the year, when the economy expanded at just 0.9 percent, the worst growth since the recession ended more than two years ago. A 2.4 percent growth rate could ease fears that the economy is on the verge of sliding back into a recession. Even so, the growth rate needs to nearly double to make a substantial dent in the unemployment rate, which remained stuck at 9.1 percent in September for the third consecutive month. “Manufacturing is in pretty decent shape, and this ends the quarter on a high note,” said Brian Jones, a senior U.S. economist at Societe Generale, who accurately forecast demand for non-transportation equipment. “We’ve got decent momentum going into the 4th quarter.” Orders for computers and related products jumped as much as six percent. A Commerce Department report is projected to show the world’s largest economy grew at a 2.5 percent annual pace in the 3rd quarter, an increase of the 1.3 percent rate in the previous three months. Societe Generale’s Jones said the gain in durable goods demand has the potential to bring GDP growth for last quarter closer to three percent. Boeing, the largest American aircraft maker, received 59 airplane orders in September, compared with 127 the preceding month. September’s decline came on the heels of a 25 percent gain in August. Orders for non-defense capital goods excluding aircraft jumped 17 percent at an annualized rate compared with an 11 percent increase in the previous three months, an indication that business investment is picking up. Additional indicators show that manufacturing, which accounts for approximately 12 percent of the economy, continues to grow. The Institute for Supply Management’s factory index rose a full point to 51.6 in September, compared with 50.6 in August. A level greater than 50 indicates that expansion is taking place. Industrial production advanced in September on demand for items such as cars and computers, according to the Federal Reserve.